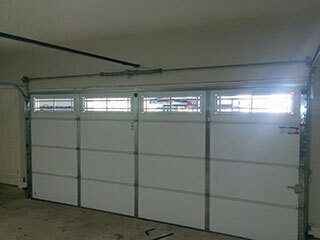 The more you use your garage door, the more its springs will suffer from wear and tear damage. Due to the nature of their operation, and the fact that they are in charge of supporting the weight of the door panels, these components are under a lot of stress on a day to day basis. When they break, they can cause a serious injury, or make your door collapse. Professional expertise is required when it comes time to deal with them. Regular spring maintenance is the best way to ensure that these dangerous components will be able to continue functioning safely and optimally for as long as possible. Our technicians can lubricate them to make sure they perform smoothly and efficiently, and we'll also adjust their tension to prevent your door from getting unbalanced and starting to tilt. The weight and size of your door can matter a great deal when it comes to how long your springs will be able to last. However, the choice between the torsion and extension type springs will often come to depend on how much backroom your garage actually has. Torsion springs, which are considered the more durable option, are installed above the door, parallel to its length. These components twist and unwind in order to generate the necessary tension, and therefore they are far less likely to whip around when they break. Extension springs, which are installed on both sides of your door, stretching towards the inside of your garage, are the older option. They were the first type to be used in garage doors. These components expand and contract to bear the door's weight, and are therefore more susceptible to wear and tear. When they break, you want to be as far away as possible, as they can whip around your garage. It is important that you never attempt to repair or replace your springs by yourself. They can cause severe injuries when mishandled, and therefore must be left to the specialists. Call our team at Garage Door Repair Portland whenever you need professional assistance.